Check out three different iOS developer resume examples – plus cover letter examples, advice, and more! Welcome back to our three-part series on applying and interviewing for an iOS developer job. In the first part of the series, you focused on the applying part of the equation – i.e. preparing your resume and cover letter. In this second part of the series, I will show you a few examples of some iOS resumes and cover letters that might be useful for reference or models. In the third and final part of the series, you will focus on the interviewing part of the equation – i.e. what types of iOS interview questions to expect and prepare for, and how to do your best in an interview. Each of the iOS developer resume examples includes a PDF sample you can download, as well as my personal opinions about what works (and doesn’t work) about each resume. Note that this is a very subjective subject and much of this is my own opinion – I realize many of you may have your own opinions. So I’d love to hear your thoughts in the comments, let’s make this a good discussion! So let’s dive right in to the examples. Contact Information. As suggested in the first part of the series, this includes name, phone number, and address for convenience of the reviewer. Summary. Also known as the objective, this is your chance to showcase what you’re all about and what you’re looking for in a job. You should customize this for the specific job you are applying to, indicating why you are a good match for that particular position. Technical Skills. Personally this (and the Work Experience section) is my favorite part of a resume! Note that each of these skills has the number of years experience in parenthesis afterwards, which is much more convenient than simply listing the skill or giving a subjective skill level like “Expert”. Work Experience. Here Charlie listed out each of his jobs and gave a few bullet points on his accomplishments and technical skills used. I like how he gave links to the apps created where possible, and mentioned specific technologies used. Note that Charlie has been a developer for a long time, so to keep his resume concise he shortened some of his older jobs. That’s a great thing! Education. Note you don’t have to go in much detail here, just mentioning the school and degree is enough. Personally, I don’t put much importance behind someone’s degree (unless it’s from a particularly impressive school or a particularly impressive accomplishment there) – what’s more important to me is the technical skills and experience. Publications. This is great stuff if you have them – it demonstrates experience, interest, and gives the reviewer a chance to read something you’ve written and learn more about you and your knowledge. Conferences. This is another great thing to add – as well as iOS meetup groups you may attend, etc. It shows you have an interest in the job and continuing education that goes beyond the 9-5. 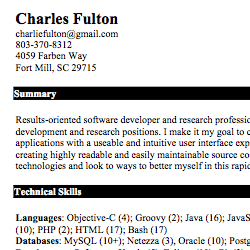 This kind of resume is nice and easy to make – Charlie just used a Microsoft Word template. The next type of resume comes from Tutorial Team member Ricardo Rendon Cepeda and is what I call the “Short and Sweet”. This is where you can fit everything the reader needs to know on one page. It works particularly well for those fresh out of college or with only a few job positions. It also works particularly well when you need to print out a resume, so you can pack it for conferences, first-round interviews, networking events, etc. Short and sweet. True to the title, it’s easy to get an idea of Ricardo’s experience and interests at a quick glance. Reference to personal website. If I ever see a personal website on a resume, I’ll definitely check it out. And Ricardo has a particularly nice one – it’s well designed, it showcases his apps, and it showcases his activity on Twitter, and is up to date. Sometimes to me this is even more helpful than the resume itself! Well designed. 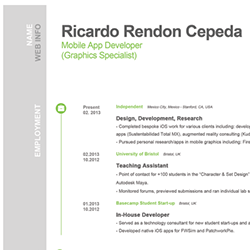 The resume looks nice and gives you the impression that Ricardo pays attention to detail. More technical detail in employment section. When I read an employment section, hearing about the name of the app isn’t enough. I’m more interested in hearing about what specific technologies you used to make the app, and how much responsibility you had for the app. Did you code it all by yourself or on a team? If on a team, what were your specific responsibilities? Did you design the app or take design input from someone else? 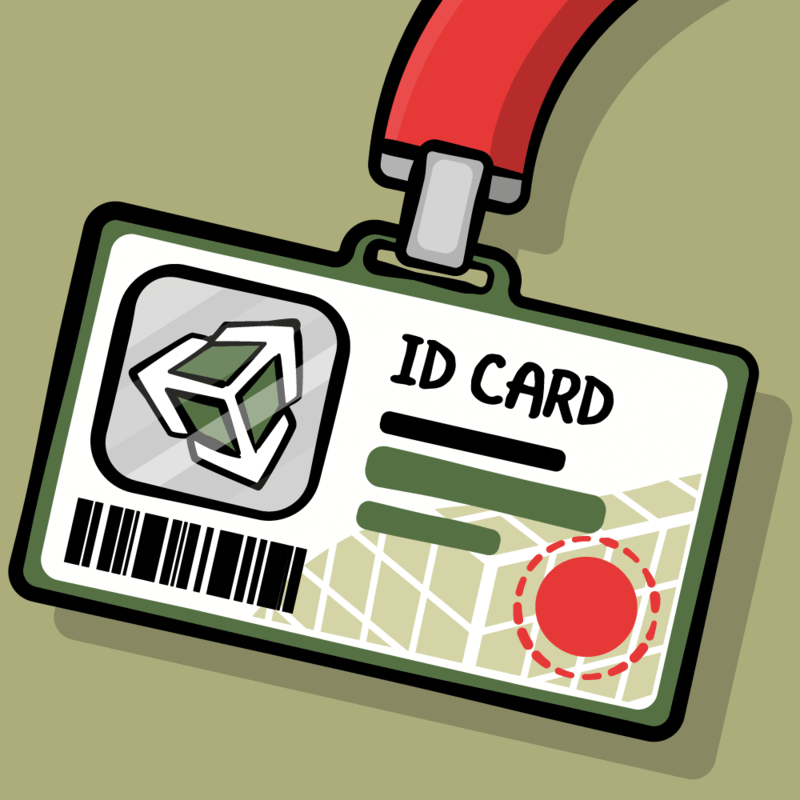 What specific technologies did you use in the app, and what skills did you learn as a result? How successful was the app? More info on your key skills. I happen to know Ricardo knows a lot about OpenGL. But from this resume, it’s hard to find out exactly how he got those skills and where he’s used them. There appears to be a thread between his coursework at school, SIGGRAPH, and app work, but it’s not clear what that is. Make sure your story comes through! Ricardo made this resume with Photoshop using a resume template. He says it’s a great way to make a resume eye–popping, but has issues exporting the text properly. He used item #2 from this list of Photoshop resume templates. 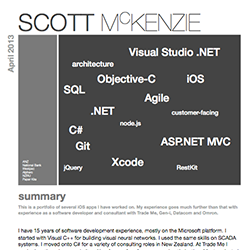 The final resume example from Technical Editor Scott McKenzie and is what I call the “Show Me The Skills”. Nice introduction. I really like the personal introduction on the resume – it tells Scott’s story well and I like how you feel you understand where he’s coming from and where he wants to go. To me that’s much better than a boring objective statement. What I Use Section. This section is great because it shows Scott is familiar with much of the core technologies we use as iOS developers. And the best part is he doesn’t just include the buzz word – he explains when and why he uses each technology. Learning Section. This is a unique section that I don’t see a lot, but I still really like because it shows Scott’s interests and that to him this is more than just a 9-5 job. App Portfolio. There’s also a nice app portfolio after the 2 “core” pages. 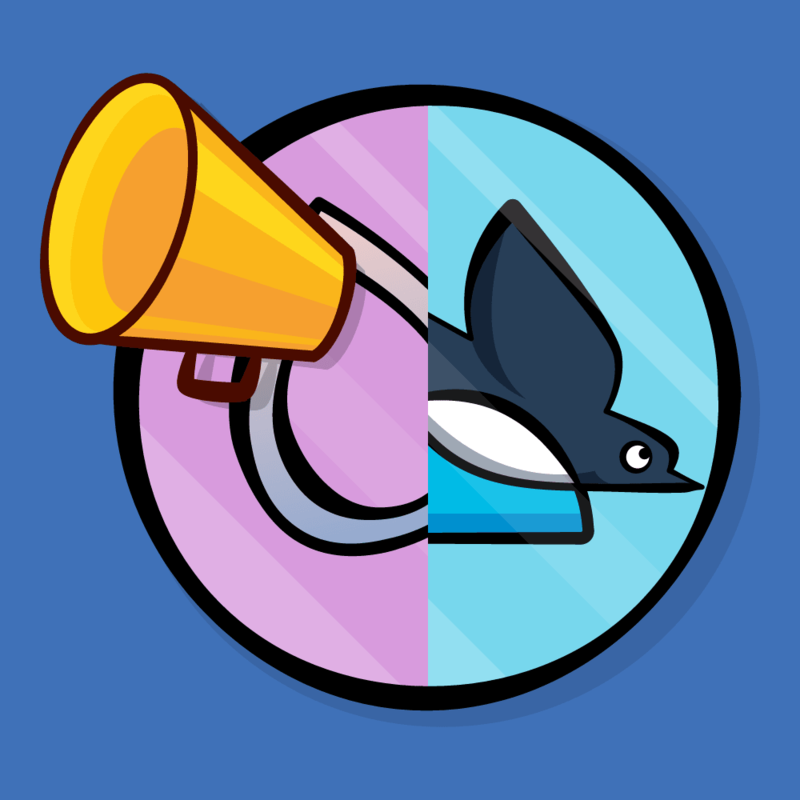 I kinda like this because it saves me time from looking them up, and includes a nice discussion of the technical challenges involved in making the app and what Scott did specifically. But I know some people get annoyed by longer resumes like this so make your best judgment call here. Word cloud and Core Skills Matrix. This is a nice way to get an idea of Scott’s skills and interests at a glance. I do wish the skills mentioned years of experience instead of “Good” or “Advanced” though. This resume is definitely a departure from the standard so isn’t for everyone, but I think it is pretty cool! 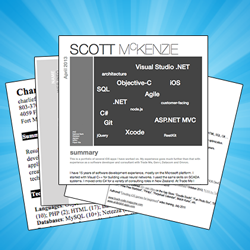 Scott said he developed this style of resume upon a particular request from a recruitment agency to showcase his “iOS portfolio”. He developed this with Pages on OS X, starting with a template and then customizing it. First things first – if you don’t know the difference between a CV and a resume, check out this handy guide. It’s typically longer. This is 3 pages instead of the typical 2. Publications are more important. Marin has an entire section on this with an impressive array. 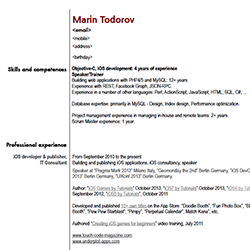 I’d consider Marin’s CV layout similar to “The Classic” resume – it’s straightforward and clearly organized. Marin made this CV using the standardized CV format template for the European Union, along with OpenOffice. That’s all for resumes and CVs, but there’s one more important aspect to cover – no pun intended! It’s the cover letter, of course! As discussed in the first part of the series, the importance of a good cover letter can’t be underestimated, so be sure to budget some time and effort to it if you’re serious about a job. I’m just going to give one example here, because cover letters need to be tailored specifically for each position that you apply to. Just the other day, I was looking up some additional tutorials on OpenGL when I saw your posting for Employee #1. I was intrigued at the start of the post, hooked by the middle, and sold at the end. My name is Brian Douglas Moakley and I’d like you to consider me for this unique position. a) An excellent writer: Believe it or not, I graduated with a minor in creative writing. Since that time, I’ve written numerous short stories, screenplays, and I’m currently working on my own series of books. I’m an avid reader and always have a book on tape on my iPod (I just finished all of Edgar Allan Poe’s short stories). I’ve also been an avid blogger, having written over a thousand articles for my zombie site, www.aworldonfire.com. b) Very good with people: I have worked with various communities throughout the years from moderating discussions on my own sites to engaging discussions with the fans over at ESPN. I try to hold true to the old sayings, “seek to understand, then to be understood”, “bad jokes are better than good flame suits”, and “avoid the bridges with suspicious shadows underneath”. c) A love of learning: At this time, I have an account at Lynda.com, an account at Safari Books Online, I participate in discussions over at Stack Overflow, and of course, I’m making my way through your very own iOS by Tutorial books. On my dog walks, I often listen to lectures from WWDC or courses from people like Brad Larsen over on iTunesU. A lot of developers i’ve known just learn enough to solve a problem. For me, I want to know how things work deep in my bones. e) In for the long haul: I’ve been visiting your site for the past year and a half and it’s nothing short of awesome. I’d love to contribute and help move the site to the next level. And well, I love working on the iPhone and iPad. The idea of doing both is simply too cool of opportunity to pass up. Being part of your company on the ground floor is truly a unique opportunity. You can check out my technical credentials over at Linked In: http://www.linkedin.com/in/briandouglasmoakley. Feel free to peruse and if you have any questions, please send them my way. And that’s a wrap for our iOS developer resume examples article! But before you go, the team and I thought we’d leave you with some final advice. You are not your harshest critic, designers are. After you make your resume, find a designer friend and ask them for help identifying “hot zones” for your resume, layout improvements, and elegant color palettes. A resume is more of a formality – other things matter more. As developers, the best way to get recruiters interested in you is to have an excellent online profile, easily accessible portfolio, and proven milestones (e.g. Published apps, StackOverflow reputation, GitHub repositories). Live in the Bay Area! Tech recruiters are ravenous out here and there is no shortage of exciting job opportunities for developers. Keep it tight; not too wordy! Let yourself shine through whatever format you’re asked to give your resume in. Give the reader what they want; easy access to information. Try to relate skills with something tangible; apps make this easier than traditional, internal corporate websites. Don’t try too hard to stand out; there’s a danger of distracting from your skills and making the reader think you’re trying to trick them. Bold things where appropriate. Bold your current skill set, your greatest project and highest education degree, and your name, so that it stands out at a quick glance. In fact, you might just make your name a different color, include your name also in the file name, and the email subject when you apply. Use hyperlinks. If anything catches the attention of an employer they should be able to click it and check it out! First things first. The first two paragraphs are most important, so make sure they catch the eye and make a good impression. Be truthful. Be sure everything in the CV is 100% true, because next step is your interview and people gonna want to know more about projects, companies, etc. Github is my CV. At this point I’m a prominent open source developer, I got here by writing libraries and contributing to projects I felt were important. For me now github is a list of projects I’ve forked and helped out on, wrote my own and it gives an impression of how much time I put overall into projects. It says what languages I’ve worked with, for how long and usually with a a bit of additional context you can see why. Technical people can take a look at the commits themselves and debate themselves whether I’m using best practices, and by seeing how well documented my code is and how well formed commit messages are they can get a sense of what it’s like dealing with me. Like a lot of things treating your github profile as your resume revolves around having enough content on it in order for it to be relevant, this means if you’re just getting started it can be difficult to get the ball rolling. But like with all open-source work, it self-perpetuates as you write some initial OSS you end up writing more and then a few weeks later you’re working on CocoaPods itself. Attend meetups and conferences. WRT getting jobs, _meetups_ & _conferences_ – easily the best resources IMO. You’ve got to be able to talk the talk so you can’t break into the obj-c scene with no experience there, but you’ll definitely get to meet a lot of people trying to hire. Everyone I’ve hired has been from me meeting them at a conference or meetup. And that’s it! Huge thanks to Charlie, Ricardo, Scott, Marin, Brian, and Orta for contributing their resume, cover letter examples, and/or tips/advice to this article in the hopes that they may be of use to others. We hope you enjoyed this second part of the series – stay tuned for part 3, where Kyle’s back to discuss iOS interview questions! In the meantime, do you have any advice or questions about developing an iOS developer resume? Join in the discussion below!